I have a thing for brownies. Really good, fudgy chocolate brownies with yummy frosting. I have a couple of recipes that I love, but this one is my favorite. The secret ingredient? Chocolate syrup. You can literally whip up the batter before your oven even preheats–I timed it. It comes together so quickly, and I love that you don’t need a mixer to make the batter or the frosting. Super easy. SUPER yummy. They’re baked in a jellyroll pan, Texas sheet cake style, so this recipe makes a lot…which is good, because the whole pan will be inhaled very quickly. (Speaking from experience.) The frosting isn’t your typical buttercream–it’s more of a fudgy consistency, and it’s absolutely the perfect complement to the brownies. My family literally begs me to make these brownies all the time. I don’t always have Hershey’s syrup in my pantry, which is probably a good thing for my waistline. 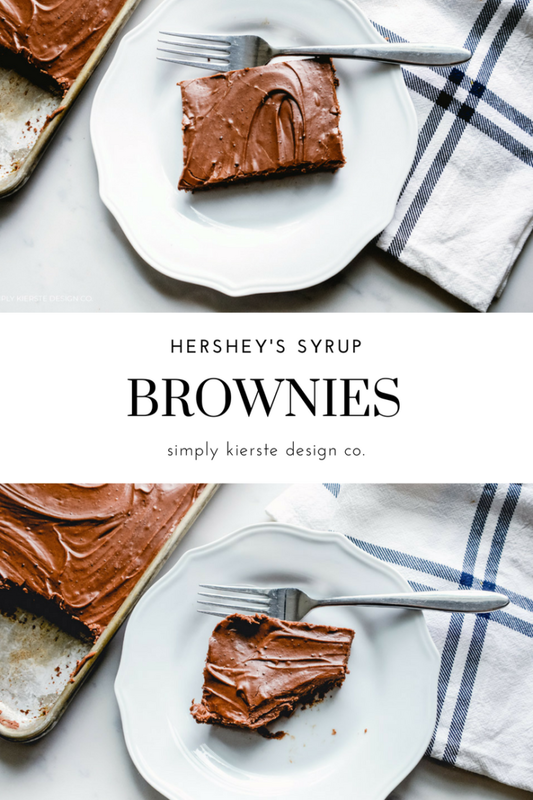 When I first came across this recipe, it called for a 16 ounce can of Hershey’s chocolate syrup. I accidentally bought the 24 ounce bottle, and so I just guessed when I added the syrup to the recipe. I ended up using more than the 16 ounces–I almost used the entire bottle–and they were still perfect. That extra few ounces of chocolate made them even more fudgy and moist, so I have continued to make them that way! If you don’t want to worry about guessing the amount, you can certainly use a 16 ounce can to make it easy. Grease the bottom of a jellyroll pan (10x15 inches), and preheat the oven to 350 degrees. Melt the butter in the microwave, then add sugar and mix well. Add eggs one a time, mixing well after each addition. Add vanilla. Add flour, and stir to combine. Add Hershey's syrup and mix well. Pour batter into the pan, then bake for 30-35 minutes or until a toothpick comes out clean. Cool for 5-10 minutes before frosting. While the brownies are cooling, make the frosting. You don't want to do this step too early, because it will harden to a fudge-like consistency and be really hard to spread. Measure the powdered sugar into a large mixing bowl. In a large glass measuring cup, or glass bowl (microwave safe), melt the butter, cocoa, and 2 tablespoons of the milk until it comes to a boil. Stir well, then add to the powdered sugar. Add the vanilla and the rest of the milk, beating with a wooden spoon until the consistency is smooth. Add a little more milk if necessary. When the brownies have cooled 5-10 minutes, spread the frosting evenly over the top.